Today’s Composer of the Day is Milton Babbitt. Yep, that’s right. He’s almost 92! Though, I won't hold my breath for the same fanfare that Elliott Carter is receiving. 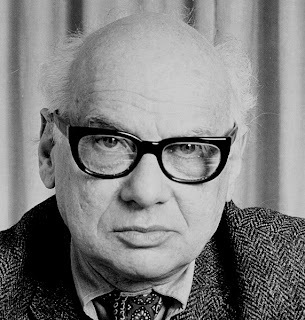 Perhaps the most serial of serialists, Milton Babbitt was born a mathematician in Philadelphia, where he learned to love the hometown A’s when they still had Jimmie Foxx and Lefty Grove. Milton even saw Ty Cobb at the end of his career. His music is often the recipient of the most belligerent critical attacks. Superficially, he embodies the stereotypical image of the all-white, elitist, academic, born-into-prosperity modern composer living in an ivory tower. He is white; his music is not for everyone; he taught at Princeton and Julliard; and lives in a cream-colored high-rise in Queens. * One of his essays, Who Cares if You Listen, still evokes strong anti-serial, anti-rational thinking sentiments. Even Bernard Holland once surprisingly took the high road when describing his music. Perhaps if we could solve the puzzles and answer the riddles, a secret drama of powerful symmetry would be revealed. Joyce's whimsical dictum that he was due the reader's undivided and enduring attention might apply here, and so I respectfully leave it to Mr. Babbitt's devotees to go about their work. But I’ll let Babbitt speak for himself. This comes from a speech that appeared in the Journal of the Arnold Schoenberg Institute, in 1976. Ours was an upheaval within a cosmic cataclysm, and there were the inevitable mutual shocks of new cognitions, of old oppositions only slowly and slightly reconciled, but the frictions paled beside the stimulations. If we [American composers], trying to come of musical age, sinned on the side of anxiety, oversusceptibility unto naivete, even gullibility, it was with a voracious enthusiasm and energy born of the unnatural suddenness of our new situation. You can listen to his music here at New Music Box—his pieces usually have goofy titles, like Around the Horn, or Three Cultivated Choruses. Milton is also a connoisseur of beer! Elitist beer, like Long Trail Ale. You should read his stuff and listen to his music. He looks and sounds cranky. He was born a mathemetician? How prodigious! If he was born "to" a mathematician, then the whole elitist stereotype is kind of de-mythologized. I didn't want that. So when is John Williams getting the Composer of the Day title? I've been waiting to throw that out there. As soon as he writes some music!